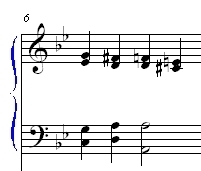 If you take a bell and divide it in half you get an octave of the first note. You can take that octave and continue to divide to higher notes. If you divide the first bell by two thirds you get a perfect fifth. And so on to produce different intervals. From C to the shining C there is a slight difference. The perfection of ratio and math will yield unpleasant results. Harmony is anything but harmonious. Dissonance abounds in what should be perfection. The math contains extreme limits to what it can produce. The notes we use today were tempered. We tinkered with the math to make it right. We forced the square peg into the round hole. "Cursed is the ground because of you"
And cursed is g minor because of it.